Today, Ford and Waze announced their partnership to bring the world’s largest community-based traffic, globally to vehicles to encourage people to help each other improve their quality of commute. Voila! You’re now plugged in to take efficient traffic routes, find cheaper fuel prices and avoid traffic accidents! In addition to the ability to report on heavy traffic, accidents and fuel prices, Ford’s integration of Waze includes recent app updates such as talk to Waze, which lets you control the app via voice command. Features also include route support for high-occupancy vehicle lanes (carpool lanes), providing additional navigation options and more accurate arrival times. 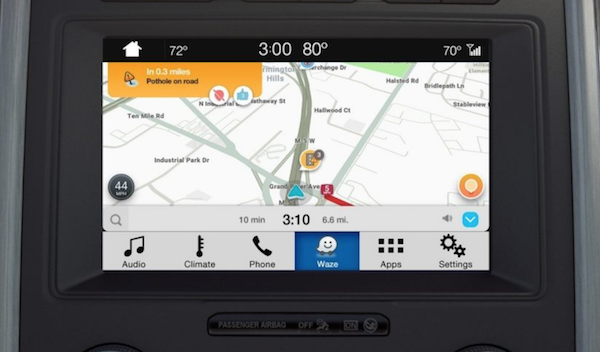 To access Waze on AppLink in your Ford vehicle, you’ll need SYNC 3 software version 3.0 or greater installed in your vehicle. You’ll also need iOS 11.3 and the Waze app downloaded on your phone. Please visit ford.com for a complete set of instructions. Print article This entry was posted by Art Eddy III on May 18, 2018 at 8:59 am, and is filed under Cars. Follow any responses to this post through RSS 2.0. Both comments and pings are currently closed.